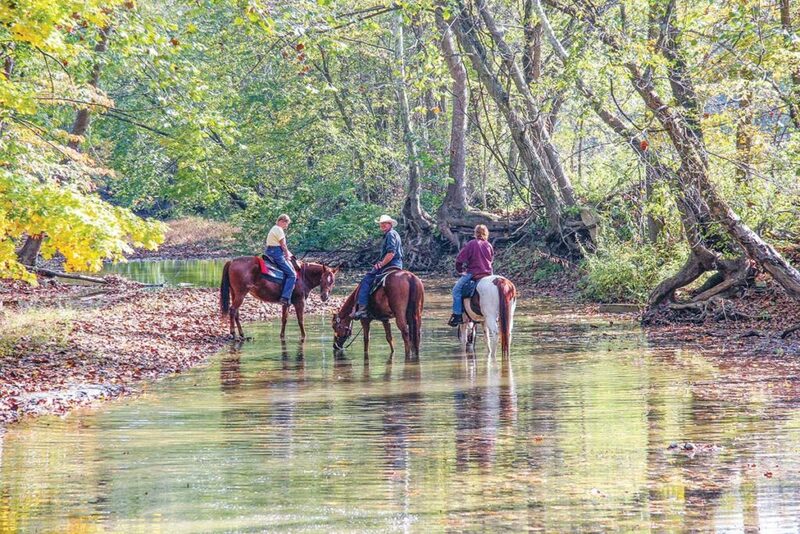 Midwest Trail Ride is a privately owned Horseman’s Campground bordering the Hoosier National Forest. Enjoy access to nearly 100 miles of well-marked trails in the timeless beauty of the Deam National Wilderness with lakes, streams, diverse stands of hardwoods, evergreens and wildflowers… all to make your ride unforgettable. Spend your weekends in log cabins, bunkhouses and campsites. Modern restrooms, showers and a dump station provide you with the necessities for camping. The fully-equipped mess hall provides meals and serves as the social activities center. You can rent a horse through Midwest or bring your own horse along with you. There are lighted, covered horse stalls with bedding along with hay, tack and farrier services. Shop at the MTR Outpost with a full line of tack and trail riding saddles. You will appreciate the gift items, western artwork, clothing and riding gear. Keep an eye out for themed weekend activities through Spring and Fall. Click Here for lodging, camping and stall rates.